The last thing I would want is to live in a place where everyone was exactly like me. So it seems both funny and tragic that two industrious European monarchs, Ferdinand and Isabella of Spain, had no problem with this. The push for homogeneity, for sameness, does often lead to traquility and a life of familiarity. However, the overzealous iron fist of sameness can cause irreparable damage, both for the majority and for the minority that is now outcast. 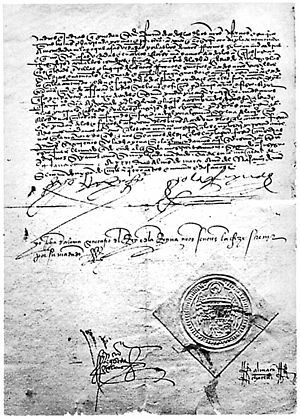 This was the case on March 31, 1492, when the Catholic monarchs of Spain issued a decree that would reverberate over three continents. Less than three months after vanquishing the last vestiges of Islamic Spain, Ferdinand and Isabella issued what was called the Alhambra Decree, later called the Edict of Expulsion. It declared that the Jews of Spain, a community that thrived on the Iberian peninsula since Roman times, had four months to liquidate their belongings and leave the country. Those who did not would face death. For centuries, Jews had lived in communities in present-day Spain, first under the Romans after the Third Jewish Revolt of the 2nd century, and subsequently under the Visigoths and Islamic Moors. Jewish Spain flourished most under Muslim rule: the caliphs of Al-Andalus (Muslim Spain) saw the Jews as fellow “People of the Book.” They were given special status, allowed to operate businesses and own land, and especially to worship with little interference from Muslim authorities. Since the Jews were an ethnic as well as religious group, there was little fear of the conversions and evangelization with Christian communities. Even as the Christian kingdoms of the peninsula gained prominence, Jews continued to live their life and worship, providing massive contributions to Iberian culture. Often, Jewish communities were the most literate, and local princes and sultans employed Jewish scribes that produced reams of edicts, writs and decrees–often in Spanish, Arabic and Hebrew. Jewish bankers and merchants helped keep the warring kingdoms solvent with trade and loans (often to the irritation of local religious zealots who saw Jews as mere usurers). Spanish Jews excelled in diplomacy, art, literature, science and philosophy through luminaries such as Maimonides, Solomon ibn Gabirol, and Yehuda Halevi. However, little by little, attitudes towards Jews in Spain began to change. Once in a while, even during the Muslim period, occasional massacres and banishments of Jews occurred, as rulers (who often could not–or would not–repay their loans to their Jewish creditors) placed Jews under more intense scrutiny. Land would eventually be taken away. Jews would be restricted to certain neighborhoods in certain cities. Jewish businesses were ransacked, synagogues were defiled, and pressure to convert or emigrate became ever greater. Then came Ferdinand and Isabella. The dynamic duo of medieval Iberia came with an agenda: unite the peninsula under one crown, one language, and especially one “true” Catholic faith. As the military might of Castile and Aragon brought the neighboring states to heel (a movement known as the Reconquista), the Catholic Monarchs had to contend with large populations of minorities, especially Jews. There is no exact number of Jews that came under Spanish rule: estimates range from 250,000 to almost 900,000. The Christian Spaniards viewed these people with suspicion and contempt, especially since they were portrayed as collaborators to the Muslim caliphs–a gross misinterpretation since the caliphs also engaged in occasional anti-Semitic abuse. Thousands of Jews sought to escape persecution through conversion to Christianity. These conversos often resumed their original status with the veneer of Catholic baptism, which infuriated local Christians. Also, many conversos were suspected of not being genuinely loyal to the church, but rather of keeping their Judaic religious practices in secret. These crypto-Jews, known as marranos, were seen as an even bigger threat, a Fifth Column that undermined the unity of the new Catholic Spain. Ferdinand and Isabella would take care of the observant Jews personally. For lack of a better pun, the Edict of Expulsion was their “final solution” to their Jewish problem. Of the 200,000 to 800,000 Jews who left in 1492, many settled in North Africa. Some went to neighboring Portugal, only to be expelled five years later. 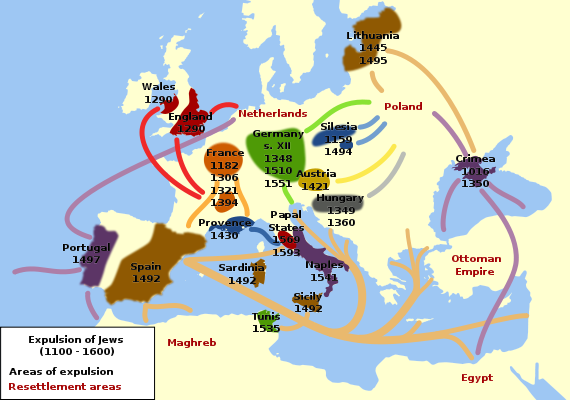 The Spanish Jews would then find refuge in Italy, in the Balkans, in Greece, and eventually in England, the Netherlands and the New World of the Americas. In the case of the Americas, the Inquisition often followed the Jews into Latin America, thus further forcing other migrations into North America and Canada. So what did Ferdinand and Isabella gain in this act? Though Spain would remain a predominantly Catholic country for the rest of its history, it is a homogeneity fed by theft, torture and murder–and the loss of two rich, sophisticated cultures in the process. There were still conversos to consider, and their allegiance would remain suspect for centuries. The missionary zeal of Torquemada would stretch into Spain’s new colonies in America; leaving men such as Bartholome de las Casas to document the tragic results. The property, businesses and riches of the expelled Jews mingled with new gold and silver from Mexico and Peru in the royal coffers. Synagogues were transformed into churches. Hebrew texts were destroyed. In the early 1600s, it was the Muslims’ turn, as thousands of moriscos, or Islamic converts to Christianity, would go down the same dark path as the Jews. So what happened to the expelled Jews? Like their kindred spread across numerous continents, the Jews of Spain provided far more than they received from the countries that hosted them. In England, Jews welcomed under Oliver Cromwell would help cement England’s maritime power. In the Netherlands, Spanish Jews would rise in the tolerant society of the Dutch Republic, and help spread trade and ideas to Asia and the New World. In the Americas, Jews would gain a foothold and create among the most free societies on the planet. Baruch Spinoza, Benjamin Cardozo, Benjamin Disraeli, and many others made great advances in philosophy, in law, in politics and government. Yet the great lesson of the Expulsion is not what was lost or gained, but what survived. In the end, Ferdinand and Isabella failed in their xenophobic quest to rid Christendom of “heretical” influences. They failed because the heresies–namely Judaism and Islam–are still alive and well. “What is the Jew?…What kind of unique creature is this whom all the rulers of all the nations of the world have disgraced and crushed and expelled and destroyed; persecuted, burned and drowned, and who, despite their anger and their fury, continues to live and to flourish. What is this Jew whom they have never succeeded in enticing with all the enticements in the world, whose oppressors and persecutors only suggested that he deny (and disown) his religion and cast aside the faithfulness of his ancestors? !